Ambassador Rebecca Adlington was delighted to present the awards to winners of our Accumulator Challenge at the House of Commons last week. Back in November, we gave 17 teams £30 each and challenged them to use the cash to raise as much as possible in 30 days. Special thanks need to go to Temple Legal Protection and Access Legal Solicitors who jointly funded each team’s £30 loan. When all was said and done, the end results were simply astounding – with a total of £14,000 raised for the Society! The Accumulator Challenge far exceeded our expectations in so many ways. The teams came up with some really creative and profitable ways to raise money – from walking, running and baking, through to waxing legs, bingo and even a Mojito Night. And then the money that was raised by the end of November made the Accumulator Challenge one of our – if not the most – successful fundraiser in our history. We are really grateful for the hard work put in by all our teams. Thanks to their efforts, we will be able to continue to support individuals and families affected by encephalitis. To celebrate the success of the Accumulator Challenge, we decided to hand out a number of awards when we visited the House of Commons on Wednesday, January 17. Rebecca and Dr Ava Easton, our Chief Executive, did the honours of handing out the awards. Evie and her family live in Malton, where the Encephalitis Society is based. When they found out about the Accumulator Challenge, they wanted to help so worked hard at school with their classmates. They sold raffle tickets and baked buns and cookies to sell. They also did a Guess the Teddy’s Name and raised a brilliant total of £133.00. We had wizards, enemies, Lion King references and lots more effort and thought put into the team names. But our panel of distinguished judges chose ENDcephalitis as the Best Team Name as it was imaginative, on brand and great for us to steal! 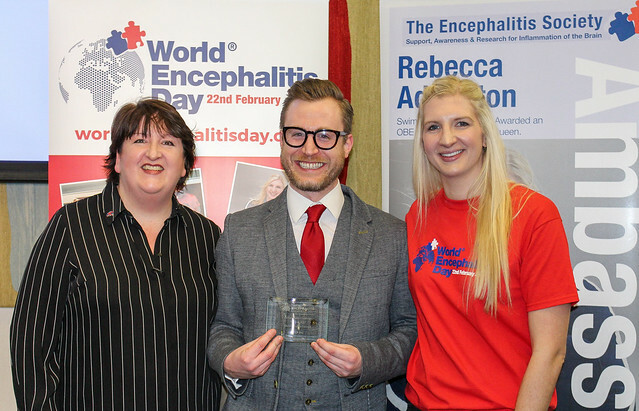 Alex has been a tremendous support to both the Encephalitis Society and her colleagues throughout the challenge. Nothing has been too much trouble and Alex has demonstrated her communication skills, shown how she has motivated her team to achieve more and shown a passion for the Encephalitis Society that is admirable. She’s been a true team leader and is a deserved winner. This was a really difficult category to judge. Teams walked, ran, baked, sold, waxed legs, played bingo, traded up but the one that stood out for us was a Mojito Night organised by Adam Lamb of the Leigh Day team. This was a fruity, fresh event which left the whole office smelling of limes and everyone feeling merry. What’s not to love? The event contributed to the 1600.23 raised by Leigh Day. Access Legal cycled 577 miles which is the distance between the mainland Shoosmiths’ offices of Edinburgh and Southampton calling in at their offices in Leeds, Manchester, Nottingham, Birmingham, Northampton, Milton Keynes, Reading, London and Basingstoke. They embraced the challenge wholeheartedly, taking turns and sharing the load in true team style. Access Legal raised £742.50 as a group, an amazing total! These wonderful wizards used some of the £30 to obtain a guitar, then sold the guitar and used some of the money to buy a bottle of gin, which persuaded a medical secretary to obtain an Everton football shirt signed by the team, They then sold the shirt and used some of the profits to buy a bottle of champagne and a small beer, to persuade - or rather, bribe - neurology registrars to compete in a massive sponsored running challenge covering one million metres in one month. They showed creativity, ingenuity and physical grit and their efforts raised a huge £1,850. Avril knows first-hand how encephalitis can impact lives as she is the sister of member, Alix Williams. Alix’s husband, Tony, contracted Brain Stem Encephalitis and ever since the family have contributed tirelessly to our work, thanking us for the support they received during their darkest times. Avril will receive her award from the Mayor of Scarborough later in January. Irwin Mitchell London raised the amazing sum of £4,167.66 through an internal high value auction in the office, which included incredible prizes such as a Tuscan apartment, cottage in Snowdonia, two different pairs of football tickets and theatre tickets to the highest bidder. In order to balance the luxury with a little pain they also arranged and completed a 5k legal walk. As a group, Irwin Mitchell raised a staggering £6,192.45. Special thanks to Access Legal Solicitor and Temple Legal Solicitors for their sponsorship of the Accumulator Challenge.